Email is an important part of business. To ensure this communication flows efficiently; good business email etiquette should be maintained from carefully formatting the messages sent and being aware of your storage requirements. Any customer queries that come in by email should be assigned a case number. This makes it easier for all lines of enquiry to be correlated and for staff to keep track of the case. Keeping this number on record and archiving these emails will help you search for the information quickly and stay on track. Embedding a signature into an email serves a good function. You can incorporate your company logo, contact details and the title of the sender. Aim to keep signatures basic; including flashing images or a lot of bright colours is not going to make you many friends. Keep it mostly text based – you don’t want to increase the size of the email unnecessarily. Similarly be wary of the attachments you send as part of email communication. Attachments quickly clog up inboxes and take up a lot of storage on email servers. If you are worried about storing emails with attachments, an email archive could take the pressure off your server meaning you won’t have to worry about the size of the files you send. When forwarding a message to a colleague or client, be aware of how the forwarded message looks. Take the subject line for examples, it’s most likely filled with “Fwd: Re: Re:” and so on, and the longer this chain of prefixes the less likely the recipient will actually see what the email is about. Include a quick note to summarize the conversation so far and why you are sending it on. The best practice when it comes to deleting email is not to do it at all. Deleting emails is very risky business, important information could be lost or you may need to call on something later on. The best practice is to implement a good email archiving system so all your email communication can be stored safely and securely. 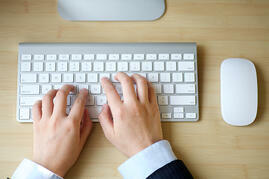 Good business email etiquette is about establishing and maintaining good practices. Email archiving can be seen to remedy many of these issues, helping you maintain good email etiquette - from efficient storage to relieving pressure on your email server allowing you to communicate freely.